Carol Woods is a whistleblower who made public certain discoveries she made, beginning around 2000. She is an old age pensioner and is not a criminal in any way, although she has been made to be seen as such and framed for crimes she didn’t commit in the past, it is very strongly alleged, since “blowing the whistle”. Her “employment cv” will state, amongst other notable achievements that she has been a former level 3 social worker and child protection officer employed by Lancashire County Council, and also she has been a former probation officer too who has, for many years, faced indescribable targeting, in the form of hostilities towards her from not only Lancashire police, it is very strongly alleged, but also the county council she was employed by, and also by many other agencies and organisations who have conspired to make her life a living hell, in one way or another, since the year 2000 – the whys and wherefores of why the year 2000 is important are described in Carol’s own words here: “York LGO Blog re Lancashire CC” http://criticalreader2006.blogspot.ae/, with it’s connected article here: “Harassment as punishment for whistle-blowing: Lancashire” http://criticalreader17.blogspot.co.uk/2017/02/ . Regarding the more domestic irregularities Carol has no choice but to endure daily are, for example, the electricity going to her home – a small bunglow in a line of post-war bungalows on a typical council estate – is tampered with with, along with the phone line and Internet broadband line connected to this abode.. The electricity is hacked often by a neighbour when it is turned on, it is very strongly alleged, so Carol has to have the electricity switiched off for most of the time. The phone lines and broadband lines connected to this home have been tampered with also, to criminal effect, it is very strongly alleged, yet no one will sort any of these situations out either, although each and I dread to think just how many times these irregularities – crimes even – have been reported to the appropriate authorities with nothing being done. After all, it is strongly alleged that these very same agencies are behind these irregularities in the first place, so, therefore, it shouldn’t be surprising nothing is done about any of it. Only recently, days before the coldest spell of weather we’ve had for many years happened, Carol’s electricity was cut off completely – it taking weeks to get back on long after the cold spell had passed, despite Carol’s many pleas to the authorities concerned about the situation. The obligation of the authority concerned to sort out this O.A.P.’s lack of electricity to her home was completely ignored. Elderly citizens have died in similar situations in the past. This preplanned and deliberate, it is strongly alleged, situation of denying Carol Woods electricity before the coldest spell of weather for many years in the UK is just one typical example of many that could be told – just one event that any other citizen would have had sorted out by the authority straightaway, but no, this electricity was cut off and designed to inflict as much upset as it could – and it succeeded. Unspeakable. 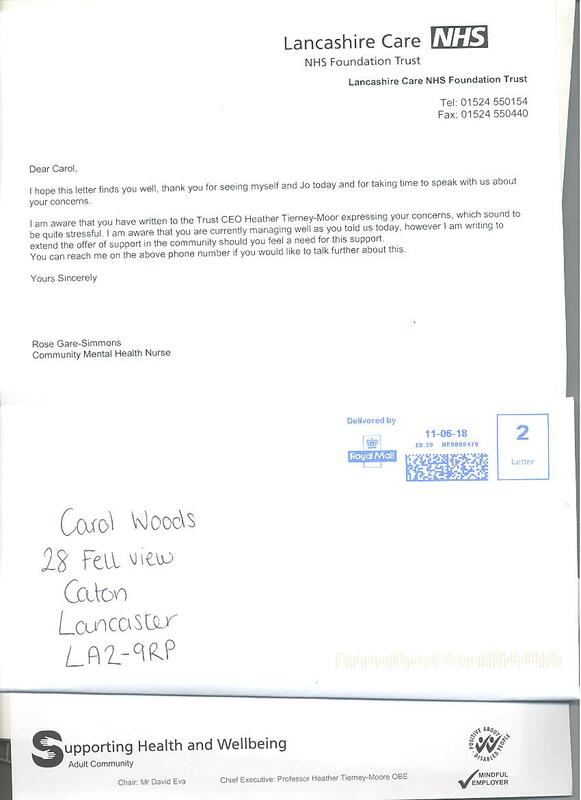 I write to you as a concerned citizen regarding the irregularity of Ms. Carol Woods, of 28 Fell View, Caton, Lancs., LA2 9RP not being supplied with the “custody records” pertaining to her arrest by Lancs. police on 31 January 2018. as UK law directs. Ms. Woods has already asked for those records formally, and been ignored by Lancs. police. I enclose a “letter of permission” from Ms. Woods [enclosed] which authorises me to liase with Lancs. police regarding this matter. Please forward, to myself, all “custody records” pertaining to Ms. Woods arrest on the 31 January 2018, along with all other pertinent information. This is a formal request to the Lancs. police Chief Constable, from myself Mr. John Graham, address above. “Lancs. police arrested Ms. Carol Woods – of 28 Fell View, Caton, Lancs., LA2 9RP – on 31 January 2018, trying to make out that Carol Woods is myself, John Graham, and that certain posts on my site http://www.butlincat.com are / were posted by her personally, when they definately are not and the entire site is under my, John Graham, of Bournemouth, UK’s control, and I have multiple witnesses to prove that to be the truth. Certain entities in Lancs. police have simply manufactured untruths relating to my site regarding who’s publishing data on it, to cause – it is alleged – distress and grief, so they can intimidate, harass and ARREST Ms. Woods, as happened recently. I am willing to prove to any government official that I control everything on this site, and can state categorically and emphatically that Carol has never posted anything on this site – rather the posts are reproduced alone by myself from communications I have received – be they from Carol, or whoever. This is a true sworn statement by myself, John Graham, made without prejudice or coercion – 08 March 2018.” [and restated / updated today 24/04/2018]. I wish to continue making the formal complaint regarding a matter I have already tried to liase with Lancs. police about – the tracking device installed via a garage under the instruction of Lancs. police, in Ms. Woods motor vehicle. The installing and subsequent use of this device by Lancs. police falls foul of not only the Data Protection Act 2000, because NOT ONLY has any proper reasoning ever been forthcoming as to why the device has been installed in Ms. Woods car [even though this question has been asked of Lancs. police many times, especially via a F.O.I.A. request made by Ms. Woods at the Hutton police HQ in January 2017, when Ms. Woods paid the appropriate fee then and there] – BUT ALSO the use of the device breaks the statute Article 8 of the E.C.H.R. – the “right to a private life”. So far my request for proper information regarding why this device is installed in Ms. Woods car has been ignored. The device being in Ms. Wood’s car is illegal anyway. Please forward exactly what the term given by Lancs. police earlier, as sent in the letter to myself from Lancs. police – that term being “covert police tactics”. Why are there ANY “covert police tactics” connected to Ms. Woods? Not only do I not need to remind you what Data Protection laws mean, as well as the E.C.H.R.’s Article 8, but I do not need to tell you either that Ms. Woods is 60+ years of age Old Age Pensioner and a former government employed Level 3 Social Worker, Child Protection Officer, and a former Probation Officer also, amongst other formal qualifications, and is no criminal. She is an honest, law abiding citizen of the UK, yet is and has been targeted mercilssly by Lancs. police, for no good and justfiable reason. Carol Woods is no “jihadi terrorist”, nor a member of any organised crime cartel, nor a criminal in any other way and to have an illegal tracking device in her car, put there by a supposedly responsible “police force” beggars belief. Why is there a tracking device in Ms. Woods car, and what is the reason for it other than to cause grief and distress every time she uses her car, which is, more or less, every time she goes out? Often she has to go – as is her right – to the local Lancashire University library to use their computers as circumstances disallow her being able to use a computer at her home, for reasons that will not be gone into here and now, but, sadly, are very much connected to certain actions connected to Lancs. police, it is VERY strongly alleged. Every time she visits this library location yobs and others interfere with whatever she is doing on the said library’s computer – these characters sit right by her with their mobile phones in the hands openly breaking the law by interfering with whatever Ms. Woods is doing on the computer, which uses public Wi-fi and is easily hackable. It is very strongly alleged that these louts and others are in the pay of Lancs. police, along with maybe certain other authrorities, to harass and interfere with whatever Ms. Woods is doing on the computers at Lancaster University. Ms. Woods has much evidence of this behaviour by louts and other dubious characters, on record. 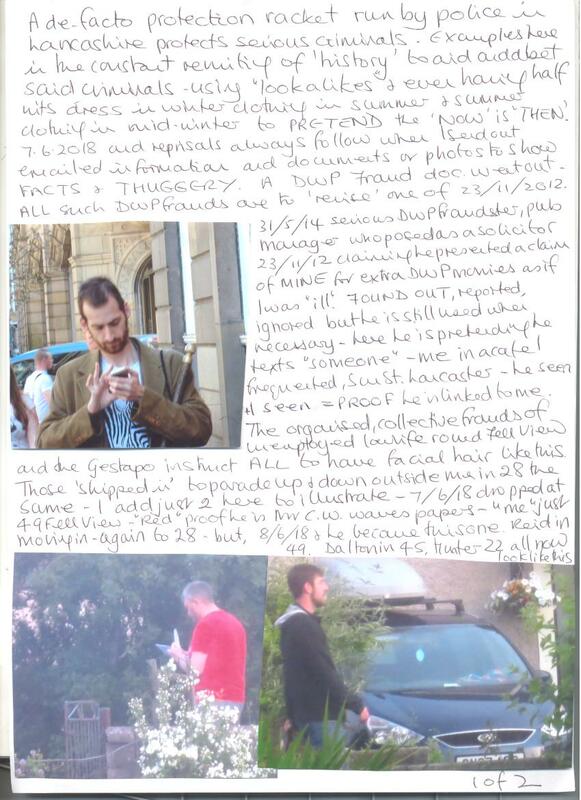 I personally reported a young male, a foreign “Deliveroo” employed delivery person who I witnessed breaking the law by riding his bicycle in the closed pedestrian-only precinct in Lancaster town centre on the Sunday afternoon I visited the town centre with Ms. Woods one day last year – this character was also witnessed visiting Lancaster University to harass Ms. Woods while she was there before AND AFTER my reporting him. This tracking device is, of course, harrassment of the most serious kind, especially as there is no good reason for the device to be in her car. It’s installation and it’s use is ILLEGAL. The computer hacking at Lancaster University library breaks cyber laws. I hereby complain formally regarding this tracking device in Ms. Wood’s car which breaches both the Data Protection Act and also Article 8 of the E.C.H.R. – the “right to a private life”, and I complain seriously regarding the hacking of computers at Lancaster library by louts and others who, it is strongly alleged, are handled by certain entities working outside the law within Lancs. police. I am not butlincat so stop trying to make MY email into his to make me him under instruction from the Gestapo of Lancs. TAKE ME OFF YOUR LIST and this cc to butlincat so he can see what lunatics I deal with. A decent design and a compelling search performance is the key to success of any website. Being a professional I can surely congratulate you on one front or website. However when I take a look at search analytics, it seems professional help is quite imperative. There are many critical factors, which contributes more towards search improvement in recent Google update. If you are astound how this is impacting your website. Then following are some critical factors which you can judge for your website. SEO errors is anessential aspect of ranking improvement; defining the SEO error priority matrix is an essence to planning. Identification of targeted landing page: This is a vital step which most of the marketers forget and start working on website as a whole. That delays the process and time for an adequate turn around. Back-links are important, however collecting random backlinks that does not have any DA and PA score is of no use. Did you make a clear check of bad-links on search console? Contentmarketing contributes about 80% in strategic marketing tactics, where just writing or posting contents won’t surely push your website position. Search Local first this is the core guideline now for any search term on web. So ensure correct location mapping for better result. If your mind spun into different directions and you struggle to understand where to start and how to start. Well we are here to help you resolve these issues to make your website a perfect one for search engine and keep your head above water. Reply us back for a more comprehensive analysis report and critical factors report to improve your web-performance. So, what we have here is a massive – and I mean overwhelmingly huge – deliberate persecution of an elderly old age pensioner who, it must be said – has never been any kind of criminal and who gave her entire working life to what can be described as being in a commendable and noble way and who stood up to the rank and unacceptable circumstances she became aware of whilst employed as a children’s social worker, employed by Lancashire Co. Council. I mean, when she saw abject wrongdoing connected to her role as protecting and attempting to help vulnerable children she spoke out about it despite being threatened not to, but the horrific payback from that – beginning in 2000 when she was forced to resign from her role with Lancs. Co. Council – is still ongoing every single day, with a cast of scores of perpetrators acting criminally in numerous conspiritorial ways. The accounts of what Carol has and is facing is described in the many posts from her on this, my site. I am punished – daily almost – by being monitored every time I go out, and also when I don’t go out, when still things happen. But this subject is not about me, and never was – these posts are about what is happening to Carol Woods by certain characters, and the serious and ignored criminality involved by perpetrators who have committed serious criminal offences – from stealing Carol’s £400,000 total value home, to much, much more – with even attempts to kill her on numerous occasions. And furthermore, I don’t want anything for doing anything connected to reporting this outrageous situation – naysayers say I do – but I couldn’t give a monkey’s about any “rewards” or anything like that – I just want these indescribable crimes, committed by public servants, and others, to stop, and stop now. The criminality of the many actions that have been ongoing for many years, along with the massive frauds that are connected to using Carol’s ID, or variations thereof – has been very much aided and abetted by the deliberate wrongly delivered mail designed for Carol Woods – courtesy specifically regarding the postman who makes those misdeliveries, which has been complained about many times to the CEO of Royal Mail, as well as many other agencies, yet still these criminal offences of wrongly delivering mail to others instead of Ms. Woods continues years after the complaints were made. This is a true sworn statement by myself John Graham on 15 June 2018.
to records, secofstate, bae146, garry.shewan, ian.pilling, johnsonb, john.humphrys, sajid.javid.mp, editor, sara.thornton, donald.toon, look.north, me, lotusprincess4u, customerinvest., ian.hopkins, info, enquiries, farront, fieldf, privateoffice, homeaffcom, telegraphedito., graham.farrant, david.lidingto. On 31 Jan 2018 I was arrested for being that male from Bournemouth and am deprived of my custody records with the recruited idiots now sending me emails and pretending they think I run the butlincat web site. This is odd, why would I sit in local libraries being hounded by loud, foul mouthed lowlife sent to distract and spoil my use? Surely I would stay somewhere private and do what I wanted to do and not be restricted to 2 hours a day? That lunacy will be dealt with but here, I Ms Carol Woods add a document for my employment tribunal claim 2402412/04 which was ONE that led to the murder of MIKE TODD GMP as he found what had happened in ALL the matters from 2001 to March 2008; then I was left alone to deal with it as he was murdered. This was ANOTHER claim of mine never entered into public records and thus never heard at tax payers’ expense. This was one tribunal (LCC and Education Directorate) with ONE perjurer JOYCE DALTON being “revised” NOW by the fraudster and worse in 45 Fell View LA2 9RP MARGARET DALTON aka WHEATFIELD ( so she says) with E-CRIME involving her son TRAVIS and an unemployed WOODRUFF in 2 Fell View who Dalton claims is her daughter trying to make herself into me. However, I in 28 Fell View have 3 daughters, she in 45 Fell View has none. This first page has IAN FISHER’s signature as their response to my IT1 submitted after being forced from another job after whistle-blowing practice, I cover up some of the page so they cannot copy MY documents and claim they are theirs which they do. They also pretend they are property of lowlife they claim is me. I saw this signature and smelled a rat but knew little then to what I know now. I found out IAN FISHER as Head of Legal Services for LCC also was the legal rep for the GESTAPO which is ILLEGAL and which was admitted and then denied as if I had made it up. Sadly for them, I have cogent evidence of FISHER being legal rep to Gestapo as well as county council. He is now hiding away in UCLAN. The other attachment is some pages from his statement offered UNDER OATH Jan 2005 for my case, and notice his signature: that is the REAL FISHER signature. In his statement, he claims my use of employment tribunal is a waste of tax payers’ money and how he is conscious of saving their money!! THIS FROM ONE WHO HAS RUN THEIR SLEAZY POLICE AND COUNCIL COSTING HUNDREDS OF THOUSANDS BY NOW TO HOUND ME. This statement was offered sworn testimony on: Fisher had been the only 1 to swear on the bible, all others using the affirmation thinking that PERJURY does not count if one affirms. In that claim, (ALL CAUGHT OUT except one who was made redundant immediately after), JOYCE DALTON was one seen to be a perjurer, another caught out who claimed to be a COURT BAILIFF was seen to be a liar and extortionist and he RAN from the tribunal room which was NOT ADDRESSED. The fraud and extortion then accounted for by corrupt staff with ANOTHER false document sent to me to make me believe something untrue, no court crest, no seal, nothing. TANYA VERONICA GRIFFITHS REPRESENTED LCC AGAIN EVEN KNOWING SHE WAS FOUND OUT TO BE A PERJURER HERSELF FROM THE EARLIER CASE. Griffiths did her best to show FISHER as “a man of importance” etc and such an honest person blah blah blah and he in his cheap ill-fitting suit looking more like a burglar that had spent his ill-gotten gains. He was a liar and MIKE TODD found out before I did, THAT THE PERSON UNDER OATH, ANSWERING AS IF HE WAS IAN FISHER AIDED BY GRIFFITHS WHO KNEW HE WAS NOT FISHER at all. I found out in 2016 and reported that to GMP whose thugs told me that “It has all been dealt with” the usual mantra. How, I asked, I didn’t know? This then to Bar Council who I know have my earlier emails to them in regard to corrupt and disgraceful barristers such as GRIFFITHS for LCC. Here we have INTENT (in issuing the first document with a bogus signature) so I wonder, I saw nothing with an original signature of Fisher on the case in question, was his signature in fact PHOTOCOPIED AND ADDED TO THE STATEMENT HE APPARENTLY COMPILED? Carol Woods Ms please feel free to quote me. 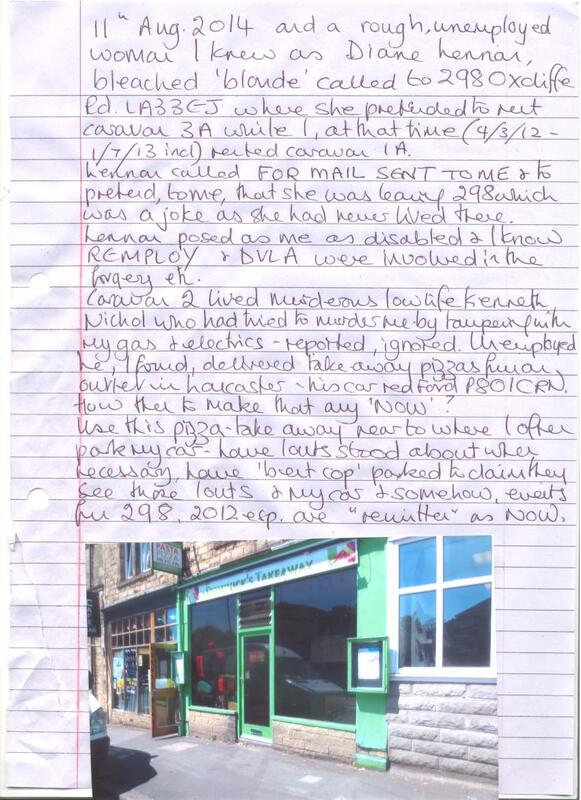 PS this was the APPEAL which I had stayed because of serious witness intimidation which was ignored when reported (one witness had her car totally written off when deliberately rammed outside my house in Jan 2006) but the staff in EAT are rotten right through and the Gestapo had JANET WOODALL false friend pose as me on 19 April 2006 to present my appeal when it was and still is STAYED. All that I found on the Internet via one in the Home office trying to support me. British justice; there is none. Ends. to bob.gallacher, ministers, david.gauke.mp, contact, info, me, bae146, lotusprincess4u, haveyoursay, cat_smith, sajid.javid.mp, lep.newsdesk, chiefexecutive, graham.farrant, policing.minis., michael.lockwo. Dear Sirs, the relevant data will follow after I record that BOOKED TO THIS COMPUTER AND SCANNER IN LANCASTER LIBRARY FOR 30 MINS USE (WHICH IS WHAT IS USUAL FOR SCANNER USE), I FIND THAT MY TIME WAS 7 MINS ONLY which means dirty work afoot, I type what I can in the remaining few minutes I have before I then go to check with staff. I also note that the Gestapo are using halfwits to walk about with WINTER COATS and FUR HOODED jackets to pretend that NOW is winter which is a usual masonic farce in use of parallel universes. The one today was to smoke, have light coloured hair and pretend somehow she was with me or was actually me. I broke off at this point and told the library staff who could not explain the timing issue. I logged on to another terminal. The woman today was to rewrite the one of Saturday with the yob sent to use the social media while I sent my emails and they were to be PROOF I was someone with 2 halfwits as companions and they were to be all those round FELL VIEW LA2 (RP caught red-handed using MY email addresses as if they were me, linked to me or had my permission. By the scanner which was obviously “dealt with” in COMPUTER MISUSE via the Gestapo, they had planted bits if filter papers that persons use to make cigarettes. They I took photos of. The Gestapo thugs are trying to invent me as someone else, the MRS CAROLE WOODS they tried from 2008. In that they AS THEY DO NOW REFUSE ME MY CUSTODY RECORDS FROM 31 JAN 2018, refused me custody records AND I GUARANTEE THAT THEY HAVE MY PRINTS AND DNA AGAIN WITH DETAILS MAKING ME THE SOMEONE ELSE. 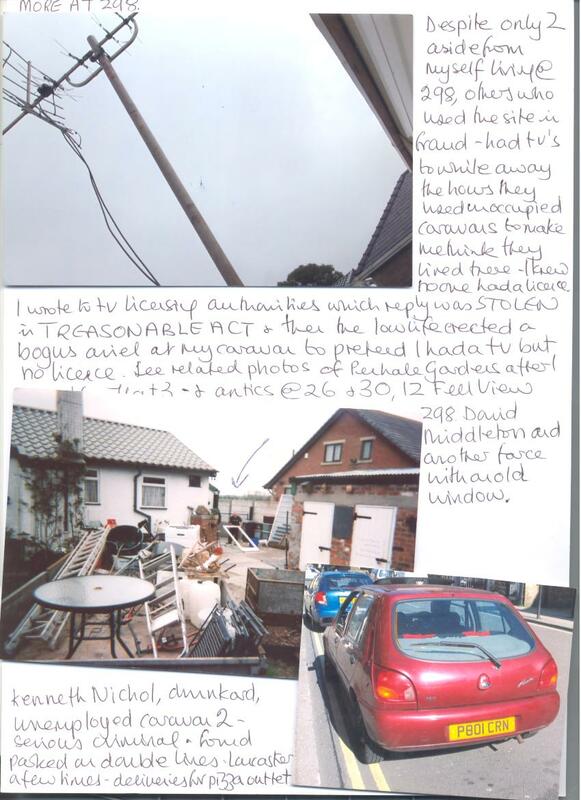 In Nov 08 arrested WITH A DAUGHTER AND 2 OF HER FRIENDS for burgling my own house, they decided not to allow me my custody records (but my daughter and one of her friends finally obtained theirs) because how I could I burgle my own house? I couldn’t so they decided to make me Mrs from Ms, Carole from Carol and Woods or WOOD, WOODRUFF etc from WOODS. In that they returned to me my bag and belongings and had a LIGHTER on the list, “NO, IT IS A USB” and they so stupid had not realised. They would have stolen all the data had they known. The arrest then of 31 Jan 2018 they thought they could use to be other arrests and stole my lap top which I only used from June 2017 anyway and only for word docs. They returned it to me after 2 months and it is sealed in a plastic bag with their prints all over it and whatever they have planted on it. They are not happy. Thus on 31 Jan 2018 they arrested me and expected to get away with making me linked to the yob T DALTON in 45 Fell View and his E-CRIME he aided and abetted with WOODRUFF and others by the Gestapo. Now, after the use of dark haired harassers and all to be “my daughter” as lowlife, car drivers WITHOUT INSURANCE (still trying to cover for T Dalton and his driving without licence or insurance aided by them) and I suggest ALL used as with criminal records to be likely to have been “my daughter” from Nov 08 thus likely BURGLARS. One used in Y274 FWP is such a one, no insurance and used for MONTHS to harass and use 13 and 15 Fell View after using 20 and 22 and pretends to be my daughter. FOUND OUT they use such as the one today with the heavy winter coat and fur hood in this heat. I took a marvellous photo of that stalker smoking and she stopped by a tourist who wanted directions and dressed appropriate to the weather: thus we have a halfwit dressed as TOLD TO and smoking and a tourist dressed for the heat: it suggests someone is not right in the head. I also record a yob in winter hoodies (they often are told to wear 2) with car silver Ford, MT55 CCX a stalker and all the usual after I park up in the Freehold area of Lancaster where I apparently live with equipment installed today for disabled, on my photos we see the lunacy in full swing. NB Please note that the 10 mins of Gestapo tampering with the scanner equipment in Lancaster library today is EXACTLY the same amount of time I am told that one who posts MY emails on his web site is having 10 min delay on his emails. That is one from Bournemouth who I was arrested for being on 31 Jan 2018 yet oddly arrested from 28 Fell View LA2 9RP and library in Lancaster tampered with in COMPUTER MISUSE yet I am apparently in Bournemouth. Do I “pop up” to use the scanner for 10 mins from Bouremouth? The photo is of one I only know as MARK pub manager ROBERT GILLOW pub Lancaster. In 2012 he stalking me I knew was up to no good and found by chance that he posed as a solicitor FOR ME in a DWP claim for extra monies as if I was “ill”. Posing as a solicitor is a criminal offence; he used a murderous lowlife ALAN McTEAR aka others and his partner to claim to be me with McTear as my partner; ALL reported, all ignored. But here the “Mark” is, one photo in a series when he was STILL USED TO STALK me and he was hiding and pretending his texts were to me in a café on Sun St Lancaster which café I ceased patronising. 31/5/14 this date BUT this fraudster used to date on many photos. He is slightly disabled and does not drive. Page 2 of attachments and this is one other caught red-handed. On 13/12/16 I went out for that day so the Gestapo assumed I would not be working in Lancaster University library (via the ILLEGAL GPS ON MY CAR) and I had called into a garden centre with shop and café. This is my receipt attached, time 15 26pm, 13.12.16. (I save ALL receipts and have them covering YEARS, anyone who is me will have my receipts yet oddly, they do not include Bournemouth shopping. Passing the university later, I called in to check my emails and found MY EMAIL ADDRESS WAS IN USE FOR REGISTRATION. The yob I caught was this one BUT this was the second time he was sent; the time I caught him he was scruffy and looks like what he clearly is. This time he was to look cleaner and hope to pass as a student so that I would think I was wrong. He is a dimwit. He then appeared a 3rd time on a date of ANOTHER attempt to “see me off”, he was sent into the library as the yob he truly is and with a companion, the same type but overweight and to be KENNETH JACKSON son (in his 50’s) of AGNES JACKSON of 26 Fell View who is ONE used in DWP frauds to be me. In June 2014, after I had moved to 28 Fell View I knew that Jackson, in her 70’s was one posing as me for gain, her son was dark, long term unemployed, overweight and a loud mouth yob sent to call on her and pretend he called on me as my son. He being dark was then “rectified” as I would not have a dark haired son or daughter (as per the smoking halfwit above) and he introduced to his mother her other son (she has been provided with at least 5 thugs as sons as if I am an idiot), the thug brought was ginger haired with the MARK facial hair. The FRAUDS and THUGGERY in that are well recorded, filmed and out of scope here BUT that yob sent to be her son had a silver VW BORA MD02 HGO and he was to pretend he was my son as my son had a silver Audi. In a FRAUD using COMET and PC WORLD on 27 Oct 2014 (all filmed) the thug finally, after using 26 where they all thought they were so clever and funny, drove off to be seen in his silver car to be PROOF MY SON had been in 26 thus Jackson was me. My son had swapped his silver Audi weeks earlier for an entirely different car. But he was why suchlike yobs were found to be used and trying to link them to me as the lunatics try to make me NOW a male from Bournemouth. Please feel free to quote me, ends Carol Woods Ms.
*In June 2015 all the heat then and ANDREW JARVIS in 41 Fell View was to wear a fur hat with earflaps and pretend it was hair to make 2015 be 2007 again when my then husband had a good head of hair and the Gestapo decided that JARVIS and his wife were me and my husband. She then I found out worked as a cleaner in Lancaster University sports’ centre IN MY NAME. Jarvis is a main fraudster in this so this can go to DWP FRAUD DEPT. Dear Sirs, more in the lunacy of Lancashire with de-facto protection rackets offered by police in SERIOUS CRIME. The photo attached of the woman outside me Ms Carol Woods in 28 Fell View LA2 9RP was sent out to show that on 4/6/18 at 6 10pm (late for council staff!!) this one was sent to walk up and down outside me as I had not gone out so they could not claim I had moved from somewhere else to Fell View. On 4/3/12 I moved to rent caravan 1A @ 298 Oxcliffe Rd LA3 3EJ so on 4th of EVERY MONTH of EVERY YEAR since, the sleazy act out events as if I have just moved AGAIN and AGAIN and so on ad infinitum. Thus she waves papers and that is proof I have just moved again. I appear to be Diane Lennon now. The car today, as the 11th is ANOTHER date I move every month of every year LT59 FGN is one used from 2014 and this photo was 3/11/15 as I was just moving then on 4th of Nov 2015. This car is sleazy from council and was used from spring 2014 when I moved to rent 28 Fell View (24/3/14 so I also move every 24th as well) but for 2 years, a pair of sleazy used it after hiding it at 31 Fell View and walking up and down outside me walking their own dog and pretending they removed a dog from someone “ill” and unable to care for it (me). They then FOUND OUT with excellent photos sent out and this car was left outside me to show me how brave and clever they could be in not hiding it, they 2 became one and she was found stalking me along the M6 motorway Aug Bank Holiday 2016 pretending she drove me. YOU FUND ALL THIS. The ‘one’ continues to be used and always now at 41 instead of at 31, (11, 21, 31, 41, 51 are ALL used, if 61 was a number on Fell View, they would use that as well). JARVIS in 41, thieves and fraudsters found out yet today, this sleazy arrives at 9 10am and parks outside me then goes to 41 to set up JARVIS yet again as if JARVIS is caring for and driving about an invisible person “ill” who is me. My car can be seen on the photo, the red Toyota which I apparently only think I have. What has the 11th to do with anything? On 11th August 2012 a DIANE LENNON called to 298 Oxcliffe Rd where I rented caravan 1A and pretended to me that she had lived there for 7 years and was leaving. Rough, bleached blonde, a “type” used but she had never lived at 298. She used it to pretend to me yet call for MY MAIL as she then was “me” posing for gain with REMPLOY (making me proven to be disabled) and applying to DVLA as if I did not have a licence. On 11 Aug 2012 she called to MAIL FOR ME which the landlady tipped her off about and thus she called and left with my mail. Thus I move every 11th as well as every 4th and every 24th (and various in and between as 1 July 2018 will be another, why? Because I left 298 on 1/7/13 and thus I also move every 1st). How to make NOW be Aug 2012 again? Saturday 9th June I had the usual harassers and stalkers but then at my car I had what is done from time to time. I park near a pizza takeaway (page 2 attached) and find the motley collection of yobs outside as I drove off, so what? I find by chance AGAIN, the Gestapo hiding parked in squad car (YOU FUND THIS) and they creep out and claim they see my car, they see the yobs at the pizza place and 2 + 2 = 5 again. Why a pizza place and 2012? See the added photos; murderous lowlife KENNETH NICHOL in caravan 2 at 298 (various attempts to murder me by tampering with my gas and electrical supply – reported – ignored) and he a drink driver (de facto protection offered) also unemployed for ever in his 60’s but he worked as pizza delivery driver in “black economy” using a pizza outlet in Lancaster which has no parking near-by so the lunatics use one to be that in “revised history” and “brainwashing” to be and one near to where I park. His car P801 CRN. The yobs are half his age but they are all to be linked to me as if I am someone of the perversions of the Gestapo, one who “likes” young males: dear me, seeing the yobs they provide and it’s enough to make any female rush to the nearest convent to take orders. Thus Saturday and the WPC hidden parked to cruise out just at the right moment which would have her claim she saw my car, she saw the yobs at the pizza place and thus somehow that means the murderous lowlife NICHOL in 2012 had not committed any crime or DWP fraud as I was somewhere else YEARS later. Thus JUNE was to be AUG and I was also to be Lennon having left 298 and being then me in a bungalow miles from 298. Oddly, despite the “blondes” sent today to walk up and down and pretend whatever their delusions allowed, DIANE LENNON is not named on my tenancy agreement and nor was it on my rent book at 298. I would not be surprised to find that LENNON was Gestapo. The others on the photo of NICHOL’s car at the pizza place where he worked weekends, are ariels the thugs at 298 planted next to my caravan as they knew I knew they had no TV licences and tried to make this PROOF I had a TV but no licence: I still have no TV. The window was ONE act of thuggery to hope I saw and forgot the WRECKING OF MY WINDOWS AT MY HOUSE IN 2008. Dear Sirs I had sent an email outlining the CONTINUING FRAUD, FORGERY (of my name), ID THEFT, HARASSMENT and STALKING etc of many round Fell View LA2 9RP where I rent 28 under duress. I am Carol Woods Ms. I sent that from Morecambe library with photos of one deranged thief JARVIS in 41 STILL aided and abetted by the de facto protection racket organised by Lancs police and the usual male low life were sent in to shout about emails and such like using names of those round FELL VIEW in lunacy of pretending that somehow they were linked to me. I left the library after also sending a CEASE and DESIST email to halfwits told to send their drivel to me and pretend they thought I ran the butlincat web site which the Gestapo are desperate to manufacture PROOF OF. The site is run from BOURNEMOUTH. They had stolen my lap top on 31 Jan 2018 and returned it 19 March 2018 where I guarantee they planted “evidence” of whatever they felt like and it has been sealed in a plastic bag with their prints all over it since: I have no lap top thus nor a phone is the lunatics have halfwits email me to PRETEND I use a computer in Bournemouth and am a MR. Thus they want an EXCUSE to steal my lap top again which actually is SOLD to someone for “safe keeping”, so, they’ve backed another loser. I attach here a DVLA letter with some details blocked out so that the Gestapo cannot quickly contact the agency and find out what else I have which damns the thieves and fraudsters involved and her it is JARVIS, the ME of last night, the ME of 2015 and her cleaner’s job in Lancaster University. 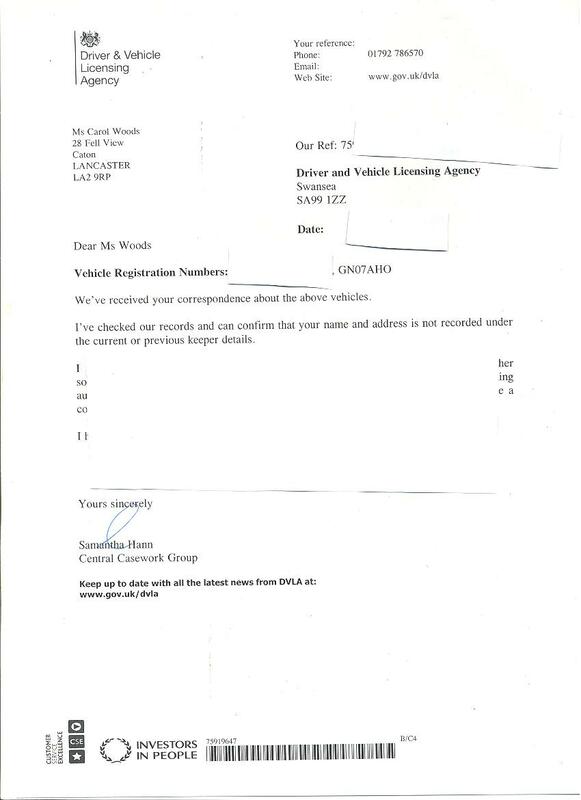 I have also blocked out the date DVLA wrote to me which slipped past the INTERCEPTORS so they will have to manufacture drivel to make up when JARVIS sold Ms WOODS the car (me) and when she bought it from Ms Woods (me) unless she is not me? She was last night again. I also cover up the other car details as MOST have a car that they claim is MINE as they pose as me. Now the Gestapo will have to change all the cars of all their fraudsters AGAIN. Jarvis’s car has remained the same all along, I can’t recall one other than has remained the same. There is an “all change” every so often. Thus we now know that JARVIS in GN07 AHO is not me whatever she forges in my name and whoever she is aided by. Please feel free to quote me, Carol Woods Ms.
Dear Sirs RE TAXI THUGS in this area; I am sick and tired of taxi thugs from 32090, 424 424, and the “6” firm mostly who ALL stalk to pretend I use them. Today I drove from Morecambe centre to Heysham and had one stalking, to make sure I pulled in twice, and did a U turn and he did the same, the bullying thug is not fit to have his licence, none is. Black Toyota, on excellent photos (as they all are) MF55 CWM. The 32090 firm often sends taxis to hide in Caton then drive off when they see my car leave and stalk to pretend; I can have 4 on any one occasion with their thuggery. WHO PAYS THESE CREEPS? They never have a passenger and the round trip to Caton must be about £20, WHO PAYS FOR IT ALL? They are not funding themselves after all this time. AND, who gives out my address and car details so they know who to stalk? Carol Woods Ms we have breaches of confidentiality and rights to privacy here. After my email and attachments of Saturday and the report of R Gare-Simmons and a.n.other no ID at all, forcing themselves on me as if I had phoned, all in email as fwd, I attach now a letter I received today which was NOT intercepted. Notice it is UNDATED and UNSIGNED and the envelope shows 2nd class from 11th AFTER my email so someone does not grasp plain, simple English. NO IS NO. THIS IS MY CEASE AND DESIST LETTER TO NHS LANCS TO STAY AWAY FROM ME AS THE KNOWN LIARS, PERJURERS, BULLIES AND WORSE YOU ARE SEEN TO BE LONG TERM at tax-payers’ expense. Thus I add: ROSE Gare Simmons is the younger sister of ANOTHER who tried to force herself on me from 2013, Karen, who tried to force on me a JO ATKINSON scruffy, aged 76 old woman who wanted to be my friend to replace the FALSE FRIEND JANET WOODALL (when I had no knowledge of what a false friend was but found out 2009) she who posed as me on 19 June 2006 in the EAT to ruin my appeal then. That is out of scope here but anyone can ask. Notice this, Gare-Simmons claims her associate, trying to force themselves on me last week, was JO when she told me at my front door (where I kept them as I had not contacted them whatever their delusions) it was another name (no ID I had to ask who they were). This is now to be OCT 2015 again and the ILLEGAL DETENTION of me after wrongful arrest and false imprisonment. Today the Gestapo outside me was to be 2 Oct 2015 with their aiding AGNES JACKSON named as thief and fraudster who thinks she can be me, on that date. Their PLAN then was to claim I followed someone to a local airport when I went abroad on 5 Oct 2015. And for which lunatic notion I was arrested on 7 Nov 2015. That is out of scope here. MELANIE FORREST colleague of Gare-Simmons looks like a bag lady but I found her to be a personal friend of police officer TRACEY KENNEDY in MY house as me. Forrest and her PERJURY tried to ensure I stayed ILLEGALLY DETAINED and, that of PC A MASSINGHAM and VARIOUS OTHERS is now to be “revised”. Thus the “Jo” referred to in the attached is to be the seedy old troll from 2013 into 2014 and she who with one even more scruffy and older than herself, did with 2 TWO managers from HOUSING pester me and pretended that the oldest there, about 80 was a psychiatrist which psychiatrist then declared in March 2016 that she had never heard of me and had never been to 28 Fell View at all. Thus we have impersonation of a psychiatrist AGAIN (not for the 1st time) and sleazy used long after they have been pensioned off aided and abetted. That is what they think they will “revise” NOW as something similar but “proper”. 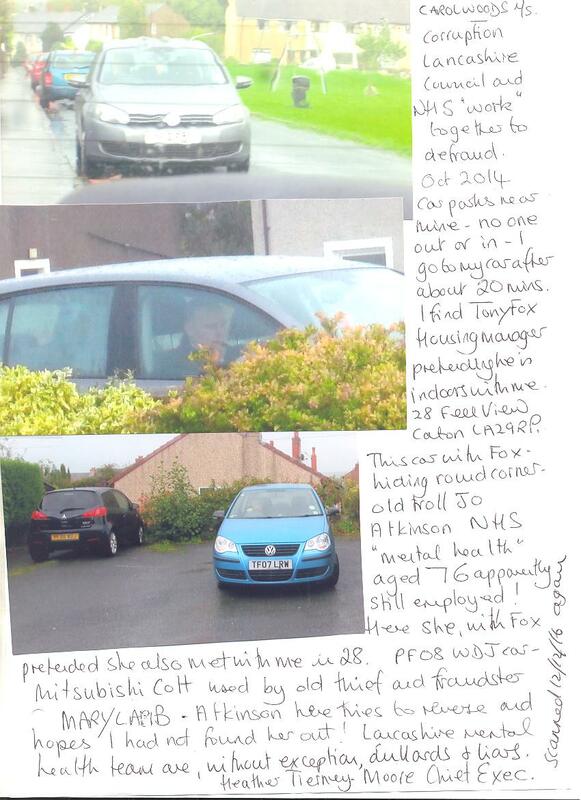 I attach also the photos of manager TONY FOX found hiding outside me in his car Oct 2014 and pretending to be indoors with me AND when I went out to get my photos, I found the pensioned off JO hiding in her car out of sight of me and BOTH pretended they were indoors with me. I guarantee that the woman stalking me on 5th June 2018 in silver Ford MX64 XEZ was also sleazy NHS pretending that she drove me about. Today the car in the same place to “drop me off” (after I parked up) was FP06 PJU a silver grey Vauxhall used at 37 Fell View and 39 in the lunacy of pretence that I live in BOTH those addresses. The FP06 sleazy has been reported by me as STALKER and HARASSER, FRAUDSTER and more. The public funds that. The old troll of Oct 2014 with FOX found out could not race off as FOX did, she had to alight and the first things she said were, “You can’t prove it was a council steel door on your house” and “You did not predict the murder”. The MURDER was SHEILA BRIDGE and my whistle-blowing of 2001 when I predicted something serious resulting from actions taken then by Lancashire Social Services and on 30 June, 2 months after my “prediction” Mrs Bridge was murdered. And now the old doxy in car FP06 will be served with a notice next time she starts to park to pretend to aid and abet thieves and fraudsters round Fell View. I hope this is clear; I will also have a CEASE and DESIST NOTICE to hand to any one else who thinks they now work for MI6. The only reason I gave them the time of day was because I am polite and well mannered. I won;t waste my time or theirs again. Profuse apologies, I forgot to add the photos I refer to: That is stress caused by the hooligans sent to harass and try to be seen “with me”, (there seems to be an endless supply). Carol Woods. Dear Sirs I, Ms Carol Woods sent 2 emails not long ago and logged out as the Gestapo sent a pair of halfwits to use the computers as close to me as possible; one female and one the usual yob type; she was, in this boiling heat, to wear a heavy winter jacket with fur hood of the GREEN type used by stalkers for YEARS. Apparently, those jackets (which are not my taste nor the taste of anyone I know) are PROOF the wearer is with me and if she sits with a male to log on after watching I do and log out when they see I do, then that is DALTON from 45 Fell View and WOODRUFF from 2 Fell View both thieves and worse using computers and phones as if me AND as if linked to me. Thus I log off, the pair in Lancaster library does and they assume they follow me out in leaving: I decided not to leave and return to do this instead. 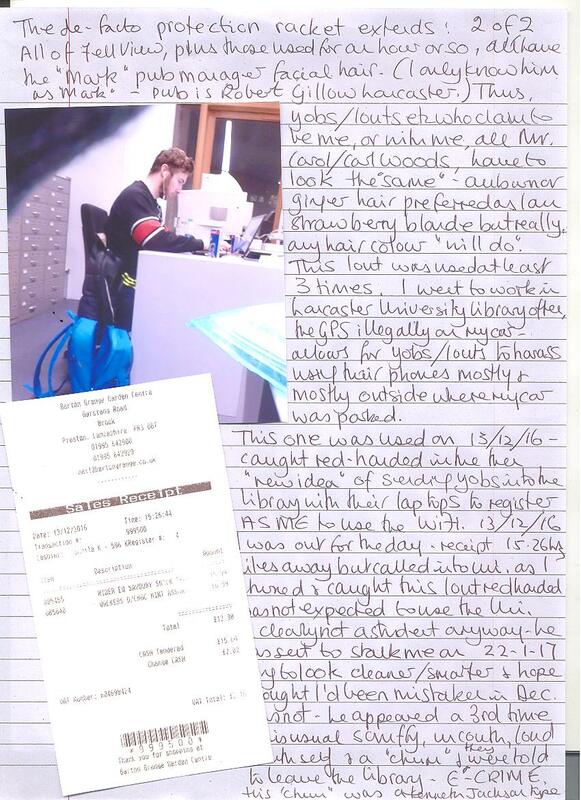 The photos attached show more harassment and lunacy in Lancashire for which YOU pay. First I add that I went out from 28 Fell View LA2 9RP over 2 hours earlier than usual today as the LOFT NOISES told me local lowlife used computers and phones as if it was my use. Clearly if I was out in my car, their use was not mine. The use of thuggery in harassment is on camera and all I note is that my report of yesterday of fraudster FV06 FDA at 2 Milestone Place off Fell View and her use of taxis of the 32090 firm where SHE pretends I ring for taxis as if I am not me with my car, I had a stalker in FV05 KHU, then a taxi hiding to wait to drive behind me when I moved my car (I moved it metres only so YOU funded him in that INTENDED FRAUD and HARASSMENT) BG59 GYU of the 32090 firm, plus a female drawn in who thought it was her chance for MI6 recruitment now: she in FV04 EOK silver grey Toyota and while gleefully driving to harass me as I walked then to the town, she not watching her driving almost hit 2 males crossing the road; on excellent photos. Thus the photos: I moved to rent accommodation on 4/3/12 to the lunacy involves the COUNCIL using YOUR money to pretend that I move on the 4th of every month of every year. This photo attached is one of their sleazy gormless sent at 6 10pm as I had not gone out so could not be said to have moved in from anywhere else, she was to walk up and down outside me and wave her bits of paper and PRETEND I had just moved in. I have sent out scores of photos all the same as they do this often. I also moved once on the 1st (of July) so I also move on the 1st of every month, and I moved to Fell View on 24 March 2014 so, they pretend I move on the 24th of everything as well. 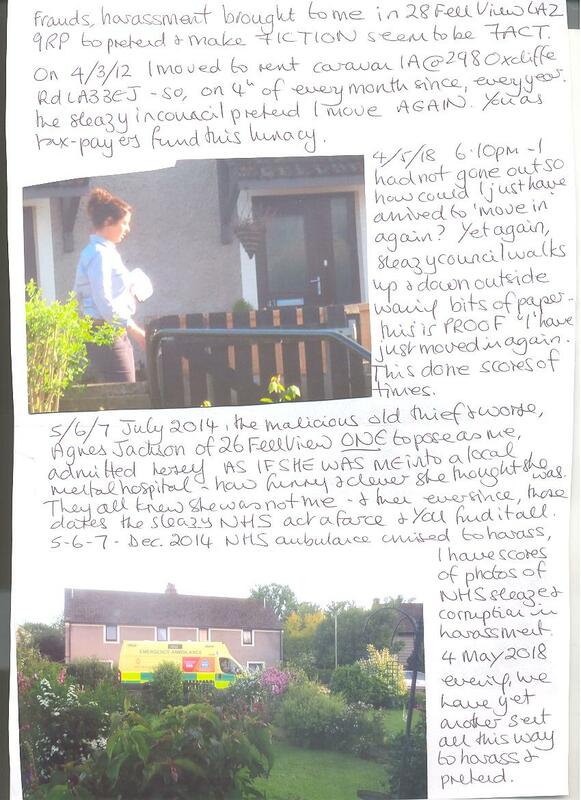 On 5/6/7 July 2014 the malicious old thief and worse AGNES JACKSON in 26 Fell View set up READY TO BE “me” for when I moved into 28, did admit herself to a local mental hospital in my name and how funny and clever they all thought they were returning her to 26. They all knew she was not me. On 26 Dec 2014 she rang the mental health team and claimed to be me “depressed” when the sleazy sent to parade up and down outside me knew I had not phoned at all. Excellent photos; I was washing my car when he arrived. 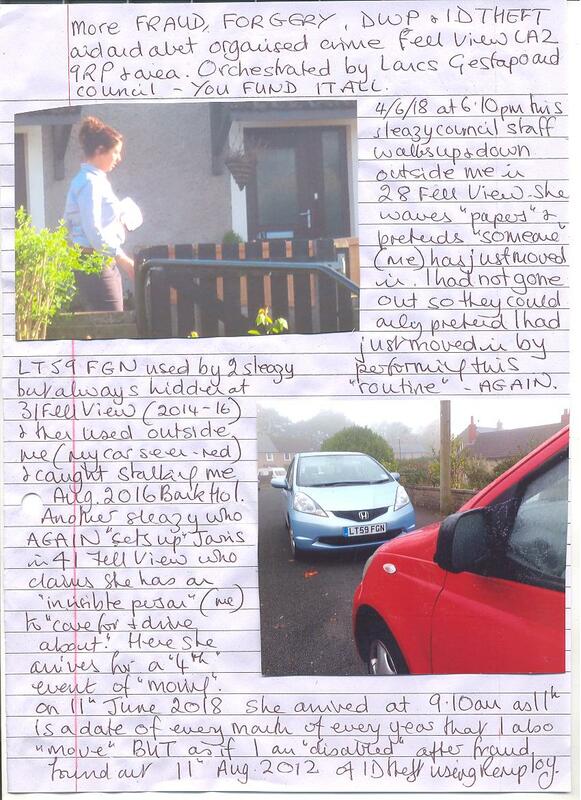 Thus 5/6/7 Dec 2015 as I returned to 28 Fell View after being out, about “tea time” one EVERY DAY an NHS ambulance stalked me and cruised along Fell View then off and PRETENDED to be dealing with me. Thus here we have the “latest” version but 4th May 2018 presumably because they wanted to link it with a supposed “move” again. On 8th June 2018 at 8am I was woken by heavy knocking on my door, NHS mental health, NO ID tags and no explanation why they harassed me. No, they could not come in, the INTENTION was to claim I rang them and they responded in this lunacy of trying to manufacture as PROOF I have a phone. One was OT staff but OT do not home visit nor do they even start work before 9am and mostly 10am. What was she doing at 8am? ROSE GARE SIMMONS with her and she pleasant but corrupt. In the last ILLEGAL DETENTION of me Rose was found crouched on the floor outside my room door using her phone for texts and pretending it was my use in my room. Another in that, LIZ BAINES, a liar and totally corrupt constantly added a phone number to my records when other, decent staff knew I had no phone and deleted it, Baines would re-add it when she was back on duty. That is who is to be “covered” for now. Who told them to call on me as if I had requested a visit? Why did they have no ID? Because it was a FARCE again and I was to forget the sleazy of earlier harassment events and forget that the persons POSING AS NHS IN LANCASTER POLICE STATION ON 7 NOV 2015 IN THAT WRONGFUL ARREST AND FALSE IMPRISONMENT AND ILLEGAL DETENTION who claimed I was deluded in saying I had had jobs I said I had had and thus needed locking up. ALL that was to be rewritten in a similar act of thuggery on 31 Jan 2018 which failed as they then had REAL NHS who would not have me locked up. They knew the police made ludicrous statements such as being a male from Bournemouth and posting items on his web site. They refuse me my custody records as they want to claim I was not released. More on NHS sleaze asap. Carol Woods Ms please feel free to quote me. Dear Sirs, today AGAIN I found the fraudster and deluded thief in 39 Fell View Mrs ANGELA O’CONNER, who claims to be ANOTHER “me” as at least 24 make the same claim round Fell View where I rent 28, a council bungalow. O’Conner is married but NEVER goes out with MR which is the same as WILLIAMS in 30 who are also me so never go out together as I am single. Like Williams and 99.9% of others, O’CONNER does not work, nor does Mr. However she has use of 5 FIVE cars which YOU fund as tax-payers. She is a bleached blonde which types are used to be me when I have never been blonde at all. Williams is white haired and she dyes her hair a yellow to be “mistaken” on CCTV cameras as me with strawberry blonde hair. O’Conners are both in their 60’s; the cars she has used in her delusions are R208 MKN a drak green Toyota YOU bought her as I have a red Toyota but she wanted to be me so she had to have a Toyota. R208 was because police officer TRACEY KENNEDY who also claims to be me had a RED TOYOTA STARLET R205 XRJ YOU bought for her in 2012 as I had then bought my red Toyota X165 YUB. Kennedy does not drive so it was left outside MY house to pretend she was me in my house with a RED TOYOTA seen outside. R208 MKN then ceased to be used in the acts of lunacy such as o’Conner thinks would convince a normal person of average intelligence. She was then bought 2 TWO Toyota Yaris cars V24 MAJ and V23 MAJ and drove them about (even though unemployed, costs seem to be no problem for yet another deluded thief and fraudster) to be ME with my RED X165 YUB although a Yaris. I left Flat 3 on 24/3/14 for 28 Hell View and found at least 24 were all ‘ME’. Then into 2016 and I found sleazy in Y547 OGW stalking me, she alone and using at least 5 addresses round Fell View and extra addresses off Fell View pretending she was driving me by stalking and pretending after I parked up. And then I was not surprised to find the sleazy driving about Mrs O’Conner with her 3 cars PLUS DG04 URX a large red Peugeot they have, and that was RYCROFT in Y96 OBU translated to O’CONNER in Y547 OGW as both RYCROFT and O’CONNER claim to be me NOT A DRIVER. Because? Because officer TRACEY KENNEDY WHO THINKS SHE IS ME IN MY HOUSE ALSO DOES NOT DRIVE. And then Mrs A O’Conner gets Y547 OGW all to herself with V23 MAJ and V24 MAJ BUT a council sleazy starts to use 37 Fell View and she has the BLUE Toyota, (I am in 37 as disabled and needing 24 hour care after an RTA apparently) so O’Conner is down to their red Peugeot and the silver Toyota plus Y547 OGW. She then stalks me in BOTH she drives and he pretends in DG04, they have a second address YOU fund where they claim to be me as Mr and Mrs Woods. But I contact DVLA about SOME cars used and attached with photos to show O’Conner’s actions in FRAUD and DVLA confirm to me that the one Yaris she is left to use with Y547 OGW is not linked to me which she uses as if she is me. I cover up the other plates I asked about, I cover up enough detail so the Gestapo cannot easily access the systems of DVLA and find what else I will prove, it will annoy them. Thus Mrs A O’CONNER and Mr are left with DG04 and Y547 which are used daily to stalk me such as today, she caught red handed again and this time with a more recent council sleazy in silver grey Vauxhall FP06 PJU reported for stalking and harassing me, today she AGAIN she had dropped me off at council flats which now I have to add to my list of where the lunatics claim I live and thus my suggestion is that I have found the SECOND ADDRESS used by O’CONNER to claim to be me, Moorlands area Lancaster, St Peter’s Rd (?). This then is another found out thief, fraudster, unemployed with more money than most I know who work for a living. I have never known either O’Conner to have a job and I have been in 28 now for over 4 years. Ends Carol Woods Ms PS I add that the Gestapo claim I am “anti police” so do not even “look at” anything I report. Well that’s OK then, that explains that does it not?